At a time when massive protests have been going on in Assam and other northeastern States against the Citizenship (Amendment) Bill, 2016, the BJP-led Arunachal Government has come forward to support it. 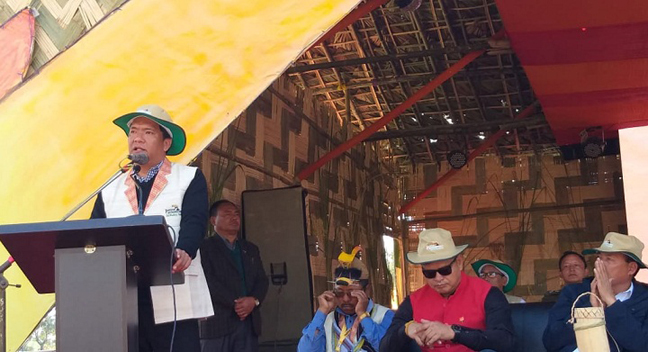 It was clearly expressed on Sunday by Arunachal Pradesh Chief Minister Pema Khandu before the media on the sidelines of the closing function of the three-day-long ‘Pakey-Paga’ (Hornbill Festival). The ‘Pakey-Paga’ was held along the Assam-Arunachal border at Seijosa in East Kameng district. “I am sure it (Citizenship Bill) will not harm us as we are safe from any kind of infiltrators due to the the Inner Line Permit (ILP) mechanism,” Arunachal Chief Minister Pema Khandu told media persons on Sunday while talking to the media on the Citizenship Bill, 2016. The Citizenship (Amendment) Bill, 2016, which has been passed in Lok Sabha, is yet to get Rajya Sabha nod. While attending the event as the chief guest, Khandu also mentioned about the history of naming after the hilly state as ‘Arunachal Pradesh’ on January 20 of 1972. On the other hand, describing the present day scenario of the hilly state, Khandu said the development, witnessed during the period of Narendra Modi-led BJP Government, was never seen during the Congress regime. “Ministers from the Prime Minister Narendra Modi-led Government come to Arunachal Pradesh to understand our will and woes, but during the Congress regime, ministers from the Centre, who came to visit Northeast, returned from Guwahati,” said Arunachal CM Khandu. He also mentioned that in the current year, the Central Government has sanctioned an allocated fund of Rs. 50,000 crore for the development of the road communication of the State, most of which has been utilised for the developmental works. Khandu also mentioned that Prime Minister Narendra Modi will visit Arunachal Pradesh on February 8 for laying foundation stone of Holongi Airport. “If everything goes okay it will take forward the State a long way,” said Khandu adding that the Prime Minster will also open the Tezu Airport on the same day.